Here are some simple kale recipes. Cooking kale is really quite simple. In the market it can generally be found throughout the year. It is very resistant to low temperatures. When picked, it remains fresh even for a week if held in a refrigerator. It is rich in vitamin C (like cabbage) and contains plenty of minerals, mainly potassium, calcium and phosphorus. Unlike other types of leafy vegetables that have relatively low energy value, kale contains a lot of carbohydrates, protein and fat that increase its calorie value. It has the amount of protein nearly three times more than cabbage, and has more minerals than all leafy vegetables. 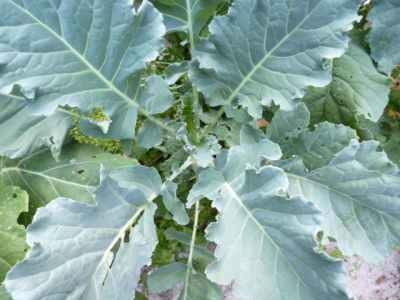 However, unlike cabbage, kale has one imperfection -- it is not suitable for pickling and storing for winter. Kale is used in stews, rolls, and can be baked or cooked. Chinese kale is wildly used in cooking. It has a longer head and is easily digestible. 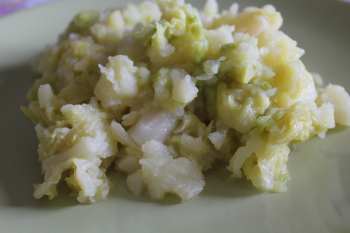 It can be prepared in a salad or used in a sauté. Brussels sprouts is a type of kale that looks like minature cabage and is especially recommended for people suffering from constipation because it contains a lot of cellulose. Put the potatoes into a deep cooking pan and add salt. Add kale and pour water to fill about ⅔ of the cooking pan. Cook in a covered pan over low heat for about 20 minutes (or until kale turns soft). Serve with fish or meat. Heat the oil in a larger pan and add the meat. Fry the meat for a few minutes, stirring frequently. Add the chopped onion and sauté. Season with salt and pepper and add the vegetable soup. When it boils, reduce the temperature to medium heat and cook covered for 30 minutes. Meanwhile wash the kale and strip off the damaged leaves and root and then cut it into small pieces. When the meat is almost done, add the kale and potatoes cut into cubes. When it boils, reduce the heat and cook for 20 minutes until potatoes get tender. A few minutes before the end of cooking add the chopped parsley. Note: Beef or lamb can be substituted with sausages. Heat the onion in oil until golden, add the vegetables, potatoes and pour over the soup. About 20 minutes before the end of cooking add the sausages. In a preheated pan add the pancetta and onion. Simmer for a few minutes and allow to cool. Meanwhile, in a different pan pour the milk and add the chopped bread, eggs and spices. Add the kale with bacon and onion. Stir well and make dumplings with your hands. Heat salted water to boiling and then add the dumplings in to cook them. Dumplings are done when they come up to the surface. Clean the kale and cook it in salted water. When it gets tender, drain it well. Place the cooked kale into an oiled baking pan and sprinkle it with bread crumbs. Mix the garlic and yogurt, stir well and pour over the kale. Bake in an oven for 20 minutes at 200° C/ 400° F.
Serve hot as a side dish with meat.